Sea Ice News Volume 5 #3 – The 2014 Sea Ice Forecast Contest | Watts Up With That? While we have done this usually a week ahead in prior years, I’m very late out of the gate this year, as I have a lot of distractions and work on my plate. Due to the deadline being today, this will be a short poll that will close at 5PM PST today. Get your votes in. Since 2008, the annual SEARCH Sea Ice Outlook (SIO) has obtained over 300 community predictions of the September sea ice extent. This year represents a transition for the SIO, as it is now managed as part of the Sea Ice Prediction Network project as a contribution to SEARCH. The goal of the SIO is to improve sea ice prediction on seasonal time-scales by developing a network of scientists and stakeholders to advance research on sea ice prediction. At a recent workshop and over the past few years, SIO contributors and users have offered many recommendations for expanding the SIO. Starting this year, the SIO reports will be responsive to these recommendations and will evolve to a more robust scientific tool. While keeping the same general structure for the SIO as before, it is time to encourage more model participation and expand the information provided from model activities. For the June and July reports (using May and June data, respectively), we request pan-Arctic Outlooks. Later in the season (early August), while updates to pan-Arctic Outlooks will be welcome, we will primarily focus on regional forecasts. However, contributions for pan-Arctic and regional will be accepted during all periods. We will also post a separate announcement calling for participants in a SIPN Action Team to work with us to further develop and steer the details of SIO reports as the season develops. We encourage all past contributors to submit Outlooks this year and we also hope to see new participants. The contest is to forecast the September monthly average Arctic sea ice extent (in million square kilometers). So since the possible range this year is so wide, I’m limiting the poll to increments of 250,000 sq Km instead of the 100,000 used in previous years. Otherwise I’ll exceed the maximum number of poll questions. As I did last year, I will submit the weighted average value of the top 5 vote-getters. A value of 6.12 million sq km will be sent to ARCUS. I predict it will be somewhere between the minimum recorded and the maximum recorded, with a slight possibility of it being below or above those levels. I also predict that it makes absolutely no difference whatsoever, but some people like to stress over it. None! You all can laugh at me now. But we will see who is laughing when I kayak ALL the way to the REAL North Pole in September. Whiskey or no, this is a GO! Does your kayak have a sail? We’re going to have another “Polar Vortex” next winter, which will limit Arctic sea ice to around 4 MKm2, but unlike last year, the grid will fail from record demand and people will die from the severe cold in the US. Unless you are being sponsored by one of the manufacturers of those inferior beverages manufactured in places outwith Scotland. Some might be interested to compare MASIE results with NOAA Sea Ice Index, since NOAA is a typical reference for Arctic Ice news. NOAA uses only passive microwave readings, while MASIE includes other sources, such as satellite images and field observations. For comparison, MASIE shows about 700,000 Km2 more ice extent than NOAA both at maximum and minimum. This is usually explained by microwave sensors seeing melt water on top of ice the same as open water. For the years 2007 to 2013 inclusive, each year MASIE shows higher maximums than NOAA, on average 5% higher. In each of those same years MASIE shows higher minimums than NOAA, on average 15% higher. The melt extent is more comparable: NOAA shows an average annual loss of 70.5 %, while MASIE shows an average loss of 67.5%. What can we expect from NOAA for 2014 minimum ice extent? Average: 4.40 MKm2, (comparable to 5.09 for MASIE)If the loss is the same as the seven-year average, the minimum for 2014 can be estimated to be 4.40MKm2, which is 13% less than the 2013 minimum of 5.08 MKm2. This is due to starting the melt with a smaller max extent. Low: 3.29 Mkm2, (comparable to 3.81 for MASIE)On the other hand, if the loss is as great as in 2012 (the record recent minimum), 2014 could go as low as 3.29 Mkm2, which would be a new record. High: 4.97 MKm2,, (comparable to 5.74 for MASIE)If the melt is as small as 2009, the 2014 minimum could be as high as 4.97 MKm2. If the 2014 NH ice extent minimum is outside this range, then maybe the climate is changing. Note that an extent matching or exceeding 2013 would be outside this range. Is there a yearly “Sea Ice Forecast Contest” for Antarctica as well? I voted 6M. My heart tells me 5.5M but if NOAA is forecasting 6.7… I want to think that they will not screw up that badly. Just two months ago the warmists bottled up their champagne glasses in the expectations of a Super El Niño and possible warmer global temperatures. Now this hope is fast fading away and add to that their only global warming talking point the lack of ice in Arctic is doing that too. Not easy to be a warmist with a straight face these days. 6.25 million km2, and that may be low. The ice up there is really smashed up by a lot of windy weather and storms, and one thing that has happened is that a lot of pressure ridges have been built up. It is like the ice is an accordion and is compressed. That creates open water, which loses heat and also forms new ice, which also gets compressed into further pressure ridges. Once the summer thaw starts those pressure ridges can start to crumble and disintegrate. They are just jumbles of loosely adhered slabs of ice, and as they fall apart it is like a small pat of butter being spread out over a large slice of bread. It shows you, in a sense, how meaningless the “extent” of ice is. When the “accordion” is compressed, the same amount of ice can have a small extent, but when the “accordion” is expanded the extent can be large. What really matters is the temperature of the water, which melts the ice much more than the air does. The sea temperature also effects the 2m air temperature, and, judging from the DMI graph of 2m air temperatures north of 80 degrees latitude, the water likely is colder. Lets remember that anything this year near normal is a huge win for those that have been preaching for years ( well before I) that its the AMO that is the major driver of arctic ice extent. Keep in mind that Dr Grays forecast implications of the flip back to the negative AMO in a permanent sense is around 2020, and this years relatively slight cooling in the AMO is a big deal as to what its showing with the ice. I wrote about this whole thing, including the linkage to the 50s hurricane burst on the east coast ( remember the AMO went cold for a time in the 50s, but the warmest water was dammed up on the east coast in the atlantic) and the coming turn for good of the AMO. I am going to show alot of this at idea, certainly not proven a only the coming 10-20 years will show it, at Heartland July 7-9 in Vegas. give it a read and watch the coming years. I am going to show alot of this at idea, certainly not proven a only the coming 10-20 years will show it, at Heartland July 7-9 in Vegas. I am going to show alot of this idea, certainly not proven, as only the coming 10-20 years will show it, at Heartland July 7-9 in Vegas. The auto-correct in this computer drives me nuts.. as it will take words and change them, and I just dont catch it sometimes. I am very sorry..Yes its my fault…as I am guilty of assuming that everything is as I thought I wrote it. 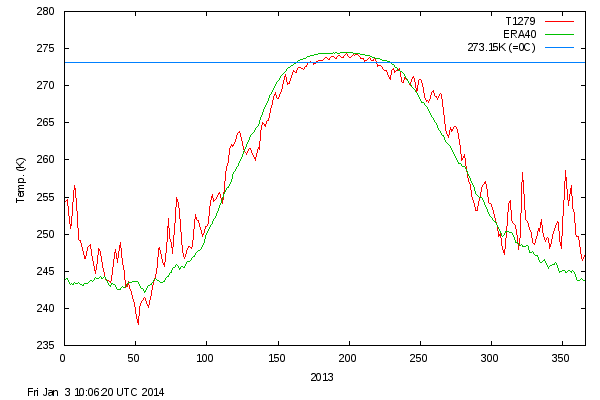 During the summer of 2013 it did run below ‘normal’ all summer. How about a vote on this? Professor Peter Wadhams of Cambridge University has predicted that the Arctic would become ice free in 2015 or 2016, but not later. Whatever the extent, all of the Polar bears will be drowned and life on our planet will cease when the atlantic conveyor stops and North American temperatures drop to 100 degrees below zero. I saw a documentary put out by NOAA called “The Day After Tomorrow”. Thank goodness our president is going to shut down all the coal plants so that all those people dont freeze to death. There are not enough books to burn to stay warm through something like that! My call: Absolute, nominal normalcy. No high records, no low records, nothing remotely approaching a record. Maybe I’m just missing something but Wadhams has been quiet this year about an ice fee Arctic. I wish he wouldn’t be as I am waiting for that Harold Camping moment. You can keep up with Waddhams’ shenanigans below. At the extremes of compression, things go beyond simple pressure ridges. Slabs of ice “obduct” and form a double thickness. Triple distilled Irish Whiskey is far superior to the Scots’ peat-soaked crud as you well know. It’s not my “own views” Anthony. In fact it’s a long list of useful facts and figures for anybody attempting to forecast the future of Arctic sea ice. A long list of useful information still noticeable only by its absence from the WUWT sea ice reference page. As we see here, the planet is still recovering from the Little Ice Age. Naturally polar ice is going to decline. Notice that in the [natural] global warming since the LIA, the trend has remained within its long term parameters. Despite all the alarmist predictions, there has been no acceleration in global warming [in fact, GW has stopped]. If polar ice declines, so what? As with rising CO2, that would be a net benefit: much shorter transit times for shipping, with much reduced fuel costs, an open northwest passage, less need for icebreakers, etc. The only reason polar ice is discussed is because of the endless predictions that Arctic ice would soon disappear. The alarmist crowd is desperately hoping that it does. But so what if it does? It’s all good… and it’s all natural. Mmm .. so no worries if there is no Arctic sea ice then ? No concerns about the temperature jump that would cause in the Arctic leading to more rapid melting of the Greenland ice mass and other land based ice sheets in the north ? People living in London, New York and many other coastal/estuary based cities might disagree. No worries. But if you want to worry about that fake scare, go right ahead. It is amusing to rational folks. Thanks for the Gray paper pdf, I see why you are enthusiastic about his work, and agree fully that deep ocean circulation is the key to climate at all timescales decadal and above. The literature of modelling of deep ocean circulation, the bipolar seesaw etc. seems to be much more meaningful than that of the atmosphere. I went with 6.25 million. I think the minimum extent will continue to rebound, but at a much lower rate since the new ice cover is reducing the outgoing IR from formerly open water. I’m also guessing that we won’t get any storms causing the ice to run pell mell out of the Arctic. Last night I saw Springwatch on the BBC. They talked to eel fishermen from near Bristol who said that this year has seen an extraordinary jump in the abundance of elvers returning from the Sargasso sea. The numbers are some 30x higher than over the last decade, during which they were in serious decline. One of them speculated that it was due to a shift in the pattern of the gulf stream. He could well be right; if he is, this could represent the overturning of the AMO and also the start of a phase of Arctic ice recovery. I was in Galway recently and discovered Paddys, truly a world class Irish whiskey. But the best Scottish malts deserve their global reputation also. Seems some may be predicting the Minimum, vs the 6.75 mm sq kms. The contest is for the Sept average, which is an amount above the minimum. That’s why the article mentions the NOAA number may be around 8 mm sq kms. Note in the bottom graph from NOAA, the Sept beginning number is about 7 mm and the Sept end number is about 9 mm. That’s the reason for the AVERAGE in Sept comment about 8 million. That would put the Sept Avg result near the 1980s, per the Red Line at the bottom of the trend chart. Probably no way to go back and change votes now, but it appears that some are predicting the low, not the Sept average. They are not providing the number the forecast contest has asked them to generate… if I am reading it correctly. June 10, 2014 at 9:32 am………? Mr. Hunt thinks people aren’t aware of the tactics. If sea ice extent increases Warmists focus on volume. If volume increases they look somewhere else. 😉 They pretend that they were never concerned about extent yet forget their ice-free screaming over the years. It really is that bad. Ben is right. I at least have placed my bet as if it were for the minimum. I would add 0.5M to make it the September average. Is this how the Last Democrat comes about? and Hudson’s Bay still is covered and has some 3m ice on the west shore. The NW passage has some extensive 4m ice – no sailing this year and the DMI north of 80 temp is substantially below normal. I note the extent graphs are showing the curve bending up and close to crossing the last year’s line. We should close in on the climatology avg line after the steeper dip (skipping rope sag) after the end of June, cross it by the end of July and get into positive territory as. 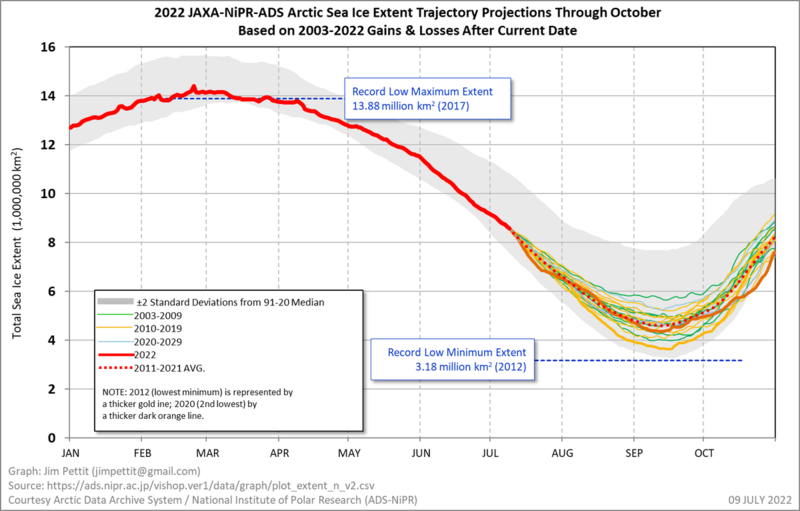 The thinning 2m+ ice starts should hold out as melting slows through mid August and levels off in mid September. An August storm would undo the forecast of course but I think this is unlikely in a cooling arctic. My forecast is that both Harrabin and Shukman will not be reporting from an ICE FREE North Pole this year. My guess is 5.5: That is the highest Sept Avg number since 2006 Per this data. My opinion is that we are now in a slow annual increase in Min ice cover over the next several years. Of course there will be large variations similar to the past 12 years. I have been collecting this data daily for the past 5 years I have the file for all old data thru Dec 31 2013. On 1 Jan 2014 there was an interruption in the daily data; then all the daily data was again posted thru Jan 15th 2014 on that date. The new file daily data for Sept 2013 was all adjusted to smaller numbers by about 200K to 275K sq Km. The March daily data was adjusted down in the range of 194K to 348K sq Km.. All of the daily data for all years was adjusted down. Lets remember that anything this year near normal is a huge win for those that have been preaching for years ( well before I) that its the AMO that is the major driver of arctic ice extent. So far this year we’ve seen a slightly above average amount of sea ice exiting through the Fram Strait. (I call it the Arctic Strait Flush.) Last year was shockingly light in this regard and I suspect the main factor in the increase in the minimum sea ice extent. Several months ago I had forecast the sea ice to come close to 6.0. That left me with a tough choice between 5.75 and 6.0. I went with 5.75. 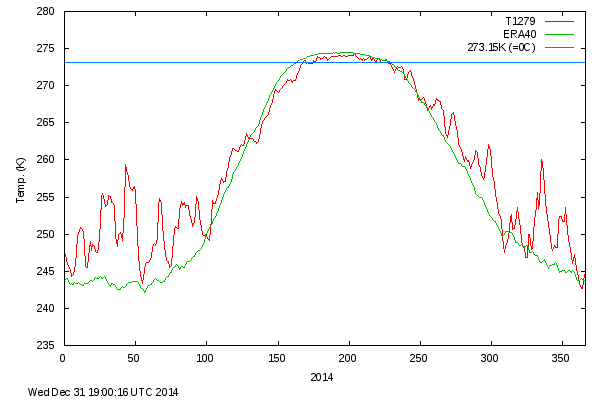 Although Arctic temperature is starting to look like it will set a new below average record for this year. I cast my vote for 4.25 though I think it will be just slightly higher than that. There is likely to be another Polar Vortex this winter setteling deep cold over much of North America. However, this years vortex will be coupled with a moderate El-Nino that will bring increased winter precipitation (snow) that will cover an area greater than 80% of the lower 48 states and break many long standing records. A side vote on insurance rate for shipping in the much-vaunted Northwest Passage, ice-free Arctic is also in order. True. But that not the chart folks need to look at. The chart that is interesting is the one that takes the current conditions and stitches the historical data to the end. So you see what the spread of history is and the boundary of past experience. it is the third on the page. one of the lessons behind making cryptic comments is this. people choose to see what they want to see. The autocorrect on your computer may be one problem for you – but seems to me some people like to “autocorrect” your climate statements as well. (SARC if I have to) Anyway, I enjoy your comments and the rest of you who are true climate observers (as opposed to scientists). So the Sept. Average is about 0.255 higher. Can you do the same chart for 2013, 2012, 2011, … with the outcome marked on each graph so we can see how good it is as an estimator? How can it be anywhere above 5.5 million sq km? 6 or 7 looks like what people voted, but that’s crazy. I know we have a bit more multi-year ice now, but just one bad wind pattern and it’s all gone. I’m with you, MrX. I went for 5.25, but I probably was thinking of minimum rather than mean, so maybe 5.5 is a better guess. I’d feel better about pushing up towards NOAA’s estimates if any details were given of their model. Thick ice has indeed increased, but there’s still plenty of 1m ice to disappear. It is not at all clear to me what Source evaluation is being asked in the poll? * National Snow & Ice Data Center (NSIDC) – 15% or Greater? It’s based on the September mean of the NSIDC sea ice extent. The crypto comment served its purpose. What do people see when you show them an inkblot. Surprised nobody figured out the purpose. Steven, it appears to me you are making the same mistake solar enthusiasts make. Let me explain. You are connecting increased CO2 to decreased Arctic ice, ascribing a cause without plausible mechanism so you must depend on wriggle watching. Solar enthusiasts do the same thing. The Earth warmed while someone said the Sun was active so the cause must be an active Sun. 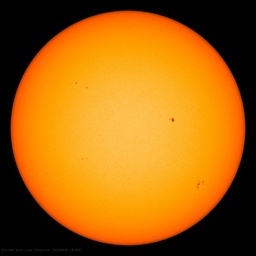 Now that the Sun is quiet, any cooling must also be caused by the Sun. Wriggle watching. Trouble is, the historical data was not as accurate as we thought. So now the solar enthusiasts will be left without their cause. I believe you will too. I doubt the minimum will be much different than last year for several reasons. First, it was a warm winter in the Arctic which means the ice did not thicken as much as it could have. Second, we still have lots of soot being emitted. Third, Russian river warmth is still going to impact the ice near them. Fourth, the geothermal impact off the northwest coast of Greenland appears to be strong. Finally, the warming due to the coming El Nino has already led to less ice on the Pacific side. My prediction is 5.5 million KM^2. I think that the warmest Arctic temps this winter since DMI temp records started in 1958, lead to less ice being formed in the Arctic this winter, which will lead to rapid thawing this summer. This rapid thaw will lead to more open water in the Arctic and more Arctic ocean heat loss during the summer months, which will lead to a rapid ice recovery as witnessed in the fall of 2012 following the strong one-in-50-yr cyclone that tore up Arctic ice in the summer of 2012. With the 30-yr AMO warm cycle winding down and the PDO 30-yr cool cycle already in effect since 2005, Arctic sea ice will slowly begin to recover and CAGW’s ice-free Arctic prediction will be yet another prediction not supported by empirical evidence…. This CAGW scam is starting to implode on a monthly basis. The CAGW advocates will get their 3-yr El Niño temp spike between now and 2016, but when the 2017 La Niña cycle occurs, the then 20+ year flat/falling trend will continue, which should pretty much put an end to the CAGW hypothesis by the end of 2018. The gigantic discrepancies between CAGW projections vs. reality will be too great to explain away. It is noteworthy that temperature anomalies in the Atlantic. This is of course result of the circulation. Cooling is explicit, particularly in the Gulf of Mexico. This will have consequences for the Gulf Stream. And don’t forget Chwisgi, we do make it in Wales! Most of it is fine with a drop of water, but not the awful habit of some cultures dropping large chunks of ice into a fine malt. Save the stuff for the Arctic! I too saw that programme re the glass eel run on the Severn and agree completely with your post. Now we need to see a recovery in the Sea Trout populations of the UK which declined in tandem with the warming AMO and whose numbers appear to me to have reponded to recent short cooling periods. Certainly that seems to be the case as far as Herling are concerned. The graph from Mr Pettit No 3 is labelled 2014 arctic sea ice extent projections based on 2003 – 2013 gains and losses. The one based on 2012 shows of course an even greater loss than 2012. It seems remarkable that the only input into the graphs is to take the starting point and then say run 2014 the same as year x with a probable 5% drop in all cases. That is not a very clever idea, possibly kindergarten level as there is no scientific input of current conditions whatsoever and with the only idea to push the possibility of a lower extent this year. For Steven to put up this simpleton graph shows the level of desperation he has sunk to. I have admired and do admire his ideas, intellect, arguments and input. However when other people put up this sort of rubbish as an argument he slaps them down pretty hard and asks them to think. I would ask him to think pretty hard about his use of this simpleton’s graph. 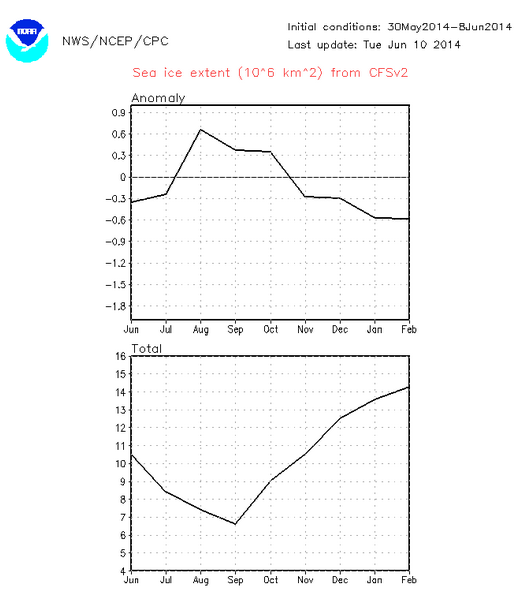 Further to this Mr Pettit also has a couple of graphs up at the Arctic Sea Ice Blog. This site has run out of date graphs for the last 18 months to promote the idea of death spirals etc. Some have stayed stuck on 2012 to promote an erroneous idea of drastic cooling and low PIOMAS over the last 18 months. Mosher has praised the site on his visits in the past but obviously only reads the comments and does not look at the graphs. The death spiral graph is pretty interesting from another point of view. Mr Petit starts off with 3 decades but skips the forth one (why?). He puts the last 12 years in grey (hard to see) outlines 2014 then compares it to a sum of the last 4 years. This effect is designed to be misleading. Mosher knows this but he puts it up anyway. For a man of principles this is hitting below the belt, arguing with emotion not reason for once and I would like you to call him out on this and ask for an apology. I would expect one and a “better set of graphs ” if he wants to play this game in future. there had been more ice growth last year… but I would bet on 4.25 milions. mostly because some parts melt every year(no matter their thickness), and those that dont do have thinner thickness this year… so 4 to 4.25. But My heart want to see 2! ans 0 next year… but of course, climate doesnt change that fast, or else we would be extinct in 50 years. It’s like I told you. You need to keep sticking the pins into that voodoo map of the Arctic, which I sent you. It just takes time. Be patient, the pin pricks are cumulative, and you can take that to the bank. Is it possible that NOAA made this prediction artificially high so that the September headlines can read “Arctic Ice Even Lower than NOAA Predicted!” ? You will not have to wait up to 5 years. of Hudson Bay. 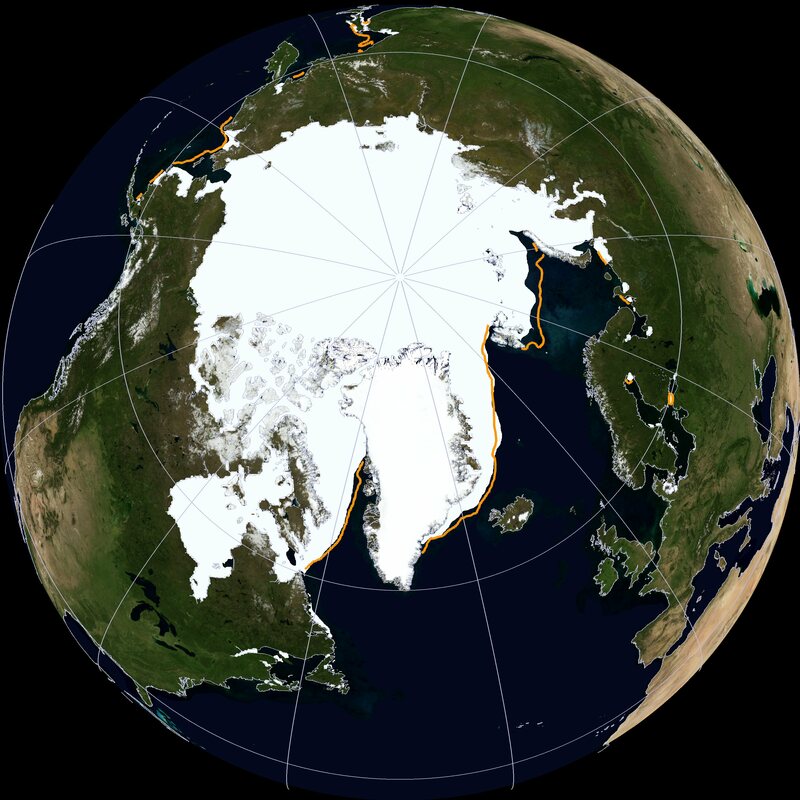 Nevertheless, satellites detected high sea ice concentrations over the Arctic as a whole. This contrasts with 2006, 2007, and 2012 when broad areas of low-concentration ice were observed.